Mary is our great helper; she it is, who presents to her divine Son, all our prayers, our tears, and our sighs; she it is, who obtains the graces for us which we need for our sanctification. 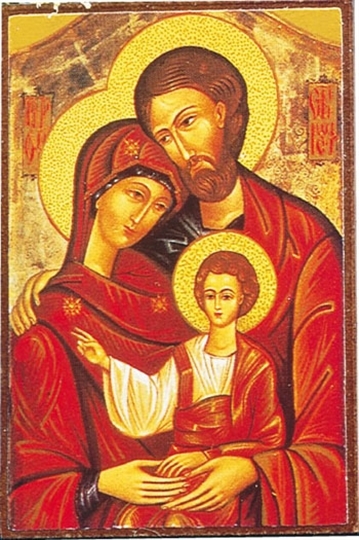 An icon of the Holy Family, available at Desmarais & Robitaille. Mary became the mother of Jesus (see Luke 1:26-56, 2:1-7*). Mary was there when Jesus performed the first of his signs during the wedding at Cana (see John 2:1-11). Mary stood by Jesus’ cross until he died (see John 19:25-30). If we want to learn more about the mother of Jesus and her role in the Church and as our spiritual mother, this month dedicated to Mary is a fitting time. So where do we look? The rosary: A wonderful way to get to know Mary is by praying the rosary on our own or with a group. As we pray to Jesus through Mary, we meditate on the mysteries of the rosary, including the annunciation to Mary, her visit to Elizabeth, Jesus’ birth, and the assumption and queenship of Mary. Rosary apps: The Spoken Rosary app guides the listener through the rosary and offers the options of hearing a scripture passage at the start of each decade and seeing a picture of each mystery. The Mary App by the Marian Fathers of the Immaculate Conception provides an interactive rosary. It also offers information about Marian consecration, dogmas, feasts, apparitions, prayers, images, and more. The Catechism: We can find Church teachings about Mary by checking the index, which lists many passages about Mary and her part in the Incarnation of Jesus, her assumption into heaven, her role as spiritual mother of and intercessor for the faithful, and so on. Papal encyclicals: If we want to know more about Mary, encyclicals by Pope Pius XII deal with her queenship (Ad Caeli Reginam); her immaculate conception (Fulgens Corona; the dogma was originally proclaimed in Ineffabilis Deus, a papal bull by Pope Pius IX); and her assumption (Munificentissimus Deus). Redemptoris Mater, an encyclical by Pope John Paul II, tells about Mary’s role in the life of the Church. The International Marian Research Institute: The “About Mary” page of the Institute’s website leads to information on Marian apparitions and shrines, Marian images, music about Mary, and much more. Books about Mary: Scott Hahn’s Hail, Holy Queen: The Mother of God in the Word of God looks at Mary’s role as set out in the Bible and at Marian doctrines such as her perpetual virginity. In The Imitation of Mary by Thomas à Kempis, we learn about “Meeting Mary,” “Knowing Mary,” “Loving Mary,” and “Calling on Mary in Prayer and Song.” And Giovanna Parravicini’s Mary, Mother of God: Her Life in Icons and Scripture features scripture passages and beautiful Marian icons. This month, I pray that we would draw closer to Mary—the Mother of God and our mother—who always leads us to Jesus. be our Advocate, O faithful Virgin. I remember when my family doctor confirmed that my husband and I had a baby on the way. Reality began to sink in. Time to start thinking about a nursery and baby needs, choosing a name for our child, and sharing our good news with family and friends. As we mark the Feast of the Annunciation, I think about how different the situation was for “a virgin betrothed to a man whose name was Joseph, of the house of David; and the virgin’s name was Mary” (Luke 1:27*). Even though he said the Lord was with her, the angel Gabriel’s sudden appearance must have frightened Mary. It must have startled her to hear that, though still a virgin, she would conceive a child through the power of the Holy Spirit. A child who would be the Son of God. And Mary had to know that telling her future husband, Joseph, and facing the harsh response of her community would be hard. She still stepped out in faith and said yes: “Behold, I am the handmaid of the Lord; let it be to me according to your word” (Luke 1:38). I am awed by Mary’s trust in God and her willingness to do what he asked of her despite the challenges she knew lay ahead (as well as those she could not have foreseen). And I wonder whether I’ve missed out on opportunities to do things God wanted me to because I wasn’t listening—and whether I would have been willing and brave enough to do them. As we marked the start of a new year on January 1st, Catholics observed the Solemnity of Mary, Mother of God. In the Anglican and United churches I attended over the years, we talked about the fact that Mary said yes when the angel Gabriel told her she would be the mother of Jesus. We spoke about how she gave birth to Jesus, raised him, and stood by him as he died on the cross. Beyond that, no one said much about Mary. Since I began attending a Catholic church, I’ve discovered more about the Blessed Virgin Mary. Mary gives us an example to follow. She is the woman of faith who said “Yes” to God, and she is the faithful woman, faithful to the ultimate consequences. This short and clear explanation was given in “Mary—A Woman for All Times and Seasons” (The Canadian League, Volume 88, No. 3, Fall 2012, pp. 2-3), the text of a homily by the Most Reverend Martin W. Currie, Archbishop of St. John’s and National Spiritual Advisor to the Catholic Women’s League.